The Natural Resources Education Center (NREC) located at Russell Preserve provides an environmental education experience for area school children and adults. The University of Illinois Extension, along with 4 other county entities, created a joint natural resources education program in 1992.The groups include the DeKalb County Forest Preserve, DeKalb County Soil and Water Conservation District and Solid Waste Management and NREC. The Natural Resources Education Consortium (NREC), as it came to be called, is housed and staffed by the University of Illinois Extension in DeKalb County. We offer a variety of programs for the surrounding communities many of which are held at forest preserves. The heart of the programming is at Russell Woods Forest Preserve at the Natural Resource Center. This is the only nature center in DeKalb County and is situated on the scenic Kishwaukee River. Our focus is educational programs for youth and special interest groups. Every first Saturday of the month, this nature program will be offered to children ages 5 & 6 years of age and parent or guardian. The program runs October 6, 2018 through the first Saturday in May 2019. Each month will be a different theme and the children will get a nature passport to have stamped to show how many programs they attended. The hour program includes a lesson with an activity, a related story, a craft, and a hike in Russell Woods. The fee is $5 per child and no charge for the occupanying parent or guardian. To register online at web.extension.illinois.edu/bdo and navigate to the right side blue section to Register Online or call center at 815-784-2000. Please call the Extension Office at 815-8194 if you have any questions. We also do family weekend programs to promote quality time for families giving them the opportunity to explore the many resources their county has to offer. 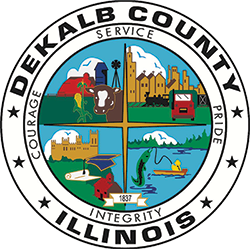 We offer a recycling program which is available to all kindergarten through 5th grade teachers at no cost, thanks to the grant from Solid Waste Management of DeKalb County. We enjoy offering the following programs to our communities. For more information please call 815-784-2000 or 815-758-8194.